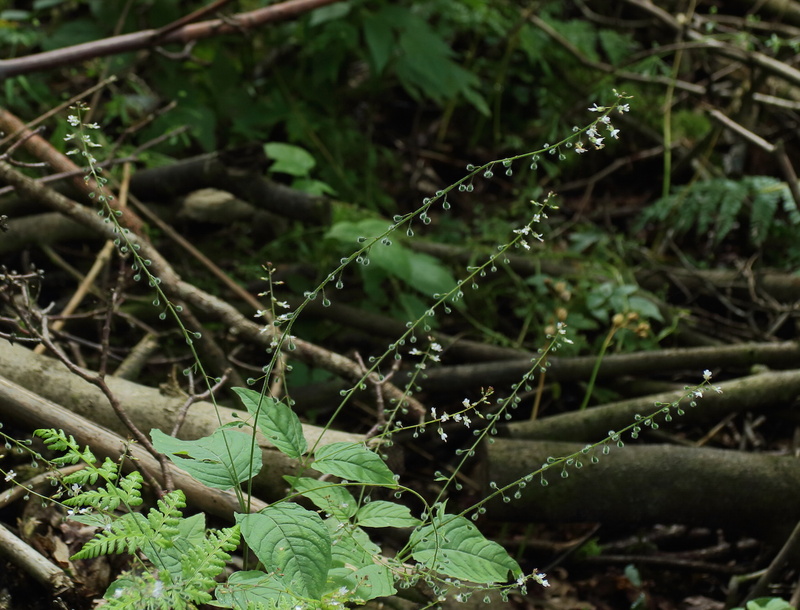 Subtly disguised as an identification feature, this piece is in essence a paean to that exquisite little plant, the Alpine Enchanter’s-nightshade, so evocative of the rocky oakwoods of the Cumbrian Lake District. 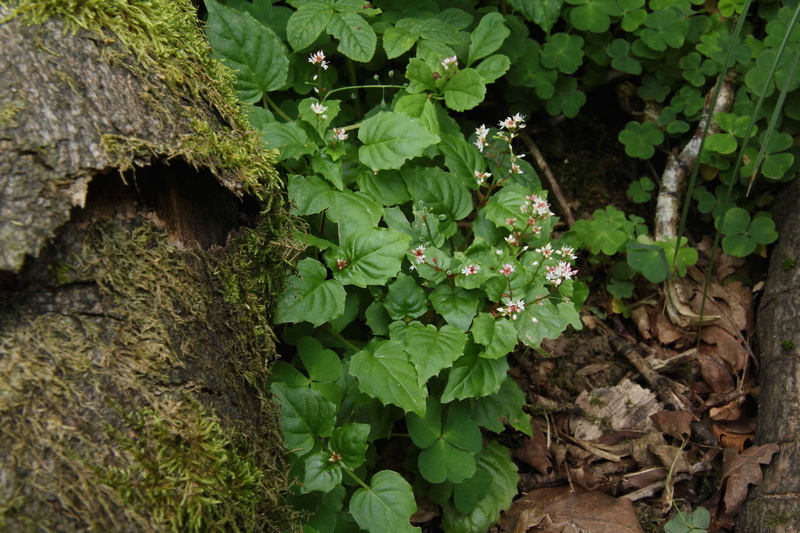 There are just three taxa to be considered in our region: the abundant Enchanter’s-nightshade Circaea lutetiana; the Alpine Enchanter’s-nightshade Circaea alpina; and their hybrid, Upland Enchanter’s-nightshade Circaea × intermedia. 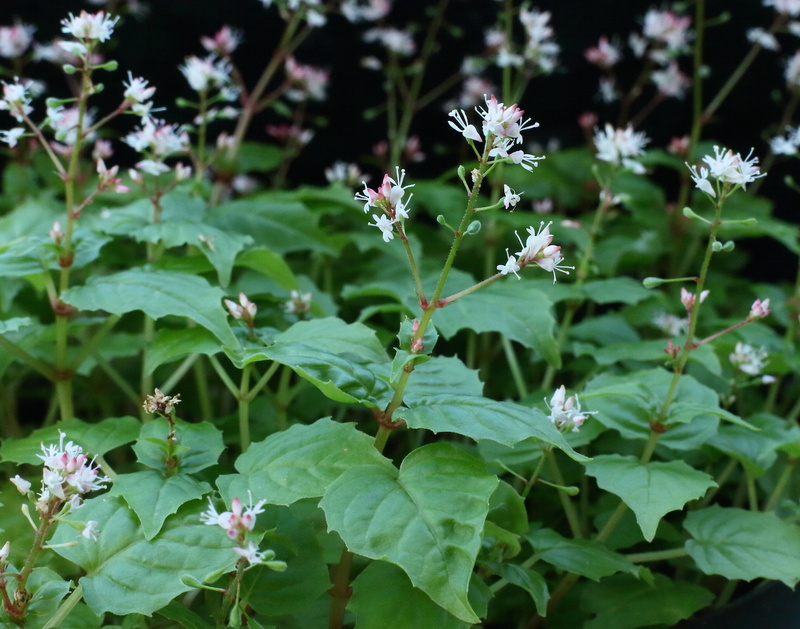 Abundant in shady places throughout, this flowers in the later season, from about the middle of July onwards at these latitudes. 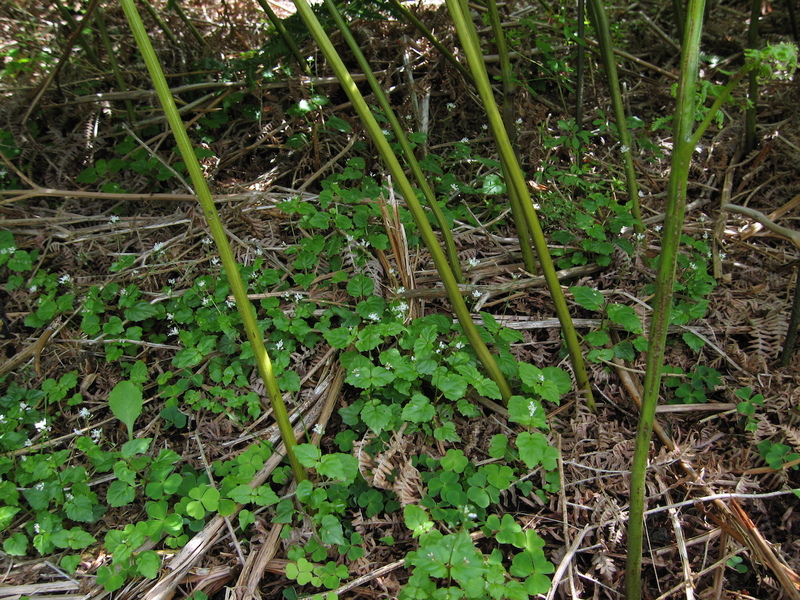 Strongly patch-forming with vigorous rhizomes. 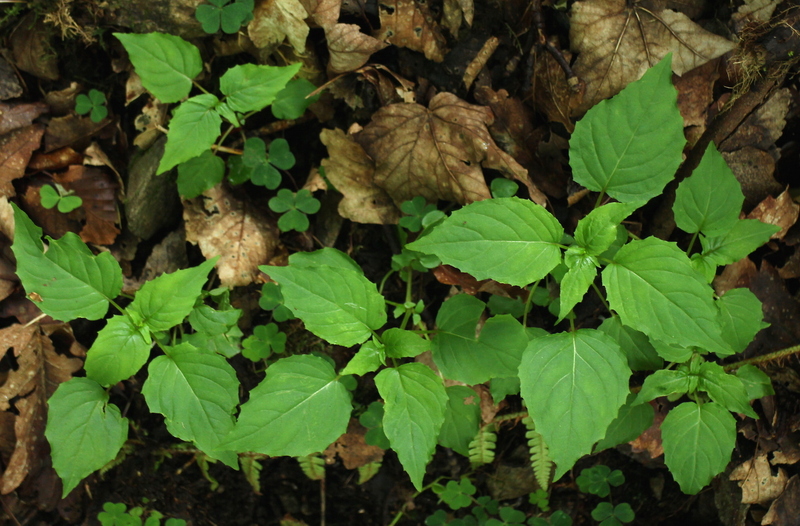 Leaves are heart-shaped, variably hairy, and somewhat wrinkled with raised sections between the veins. 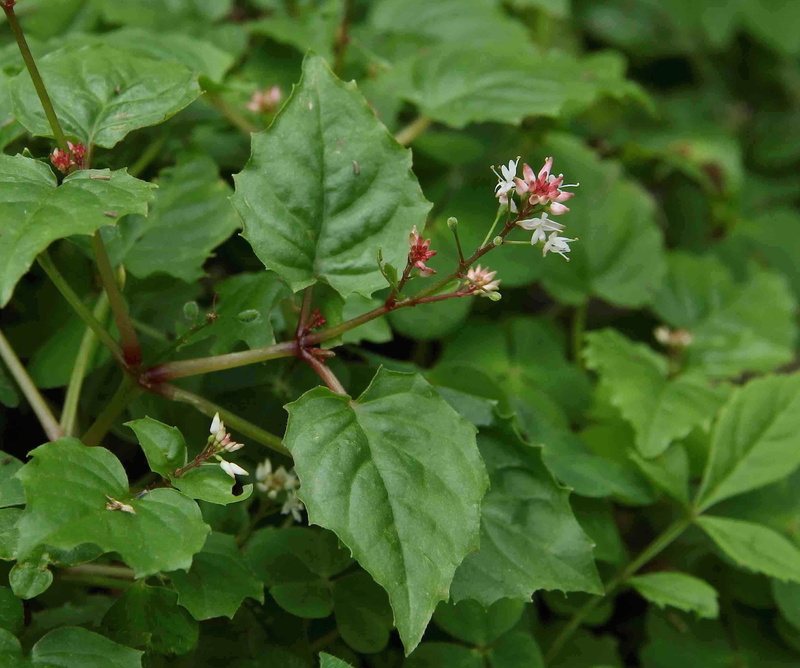 The leaf-margin has no obvious toothing, with at most sinuate lobing. 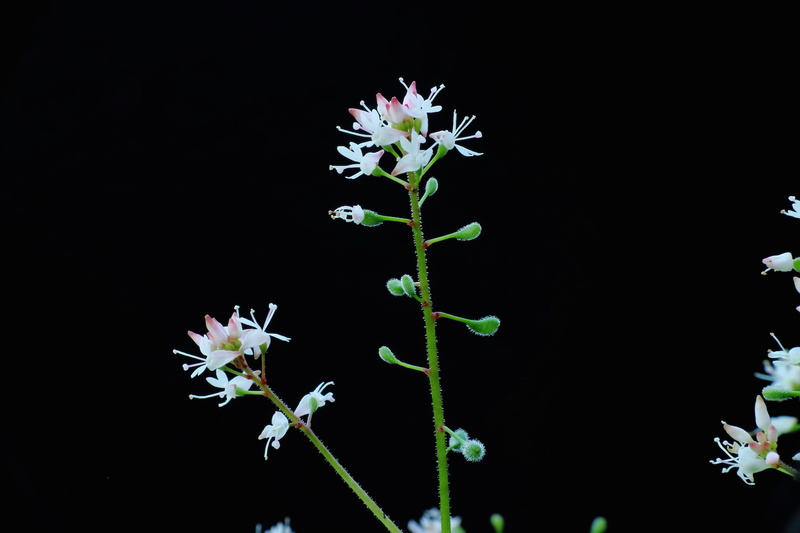 The flowering stem rapidly elongates, so that the smallish white flowers are ‘left behind’: dispersed down the stem below a head of pointed pink buds. Below the open flowers, as the stem further elongates, abundant ripening fruits persist along the stem for many weeks until ripe. 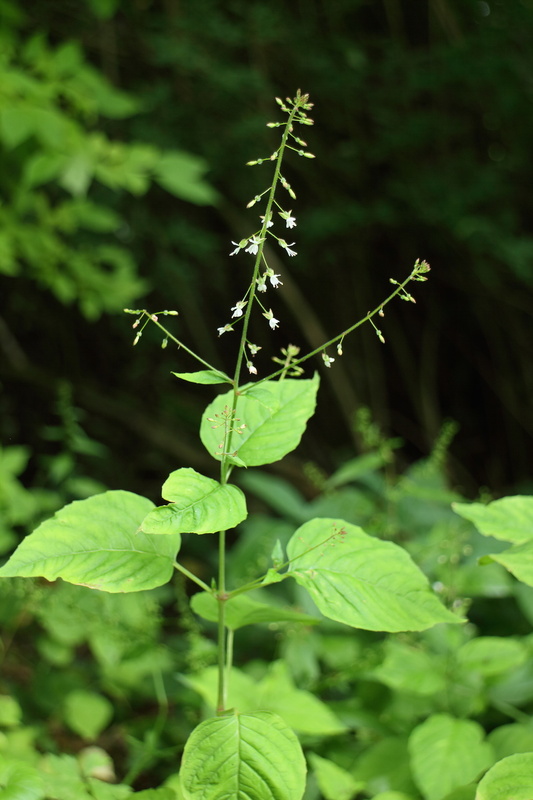 This is a very much smaller plant, almost squat, compared to both the Common Enchanter’s-nightshade and their hybrid. It is largely hairless, but there are stalked glands along the flowering stems. 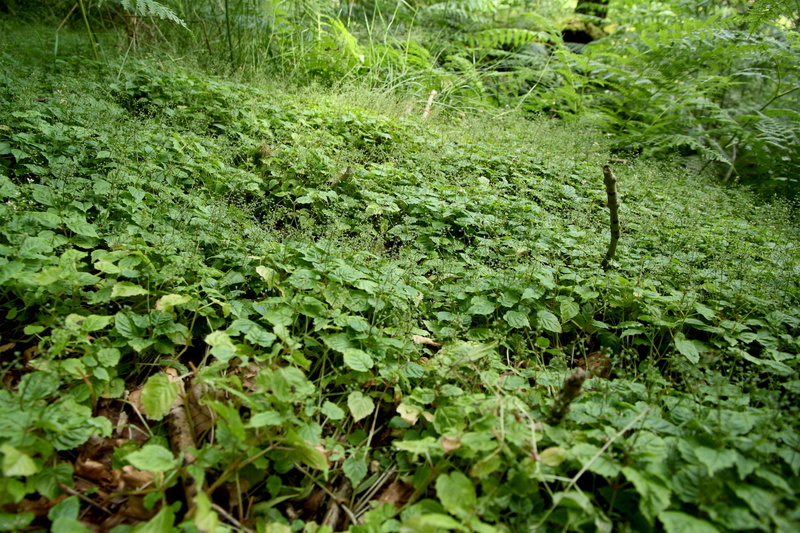 It has far-spreading stolons, and so can occur as scattered shoots between boulders, or in very favourable sites can make dense mats. 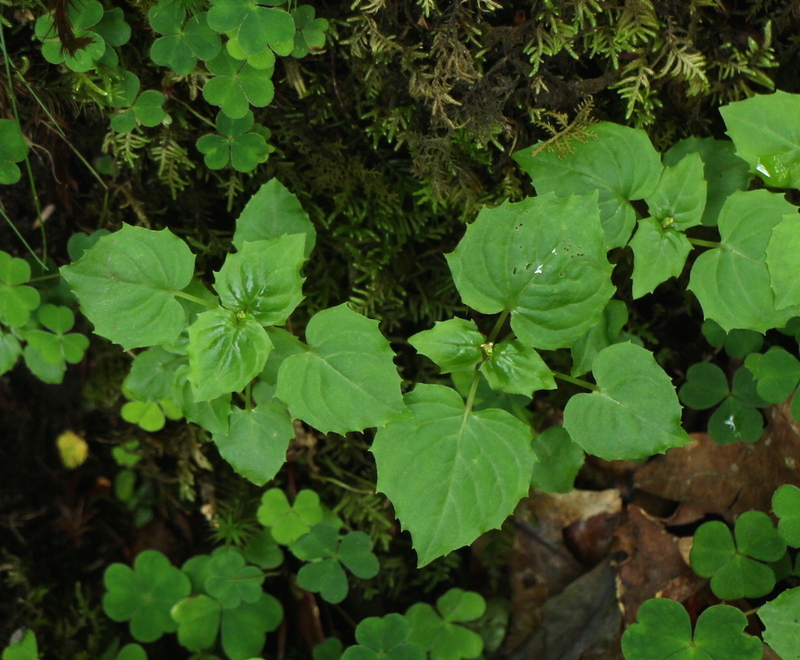 The leaf blade is small, and about as wide as it is long – a crucial distinguishing feature from its hybrid. This is in marked contrast to its hybrid, in which the leaf blade is always larger, and distinctly longer than wide. 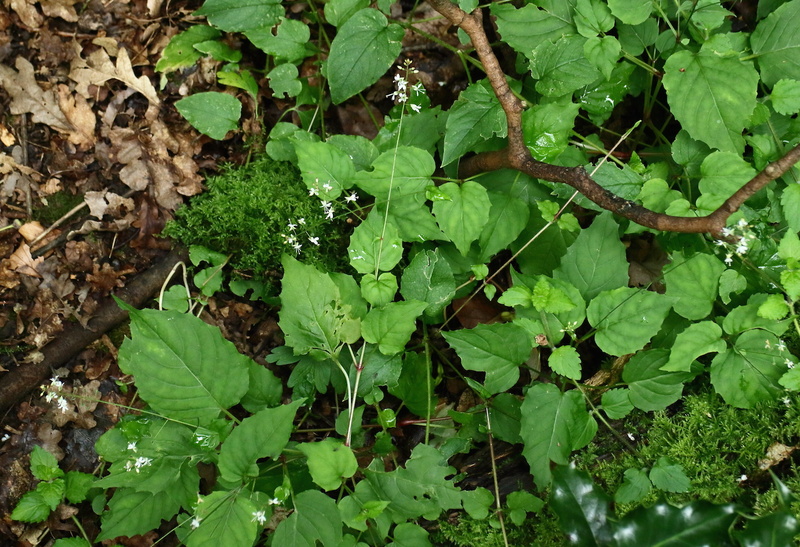 The margin of the leaf blade is well-marked by strongly-developed sinuate toothing. 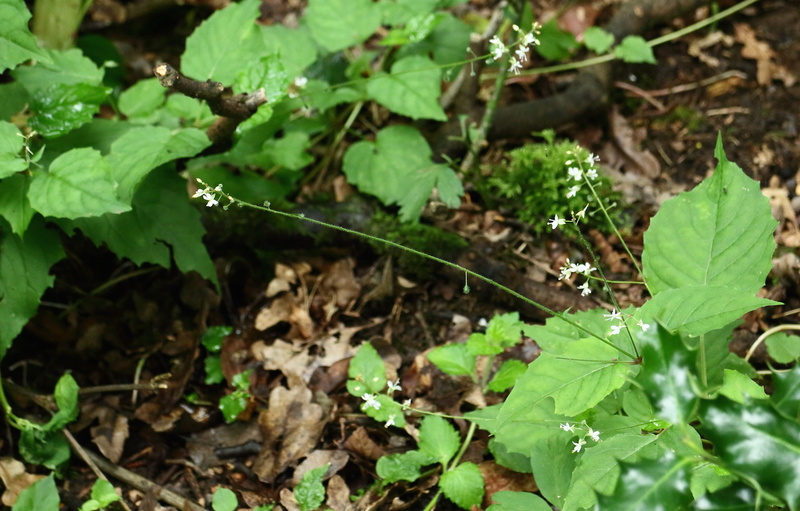 The flowering stem remains relatively short, and extends more slowly, resulting in the flowers remaining in a compact head at the tip of the stem, and not extending down the stem in an elongated inflorescence like the other two taxa. The flowers are tiny compared to the other two taxa, but with the buds being flushed strongly with rose-pink, the tight heads of flowers can be quite colourful. 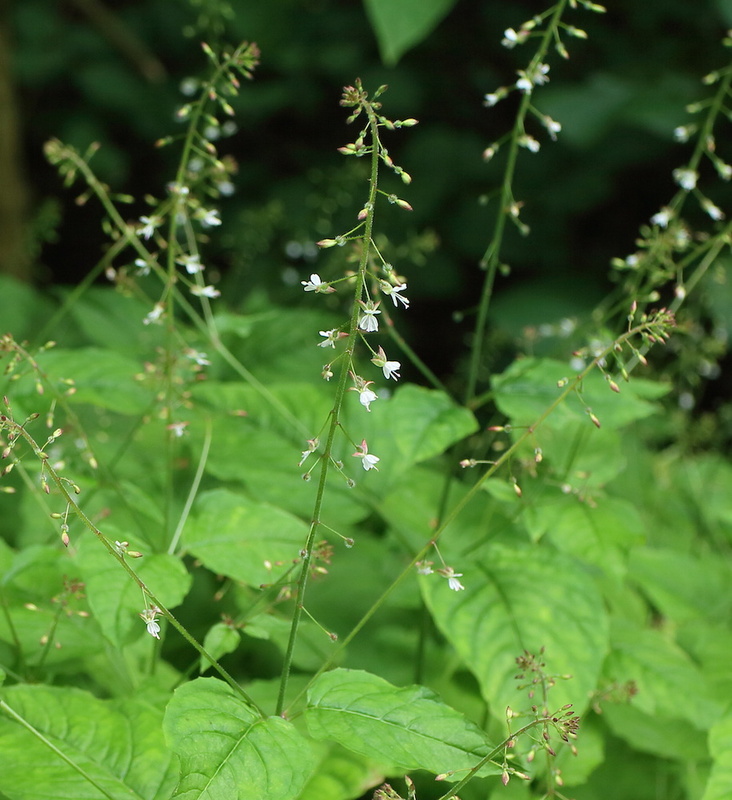 As with Common Enchanter’s-nightshade, the fruits remain on the stem during ripening so that well into August the stem carries many ripe fruits. 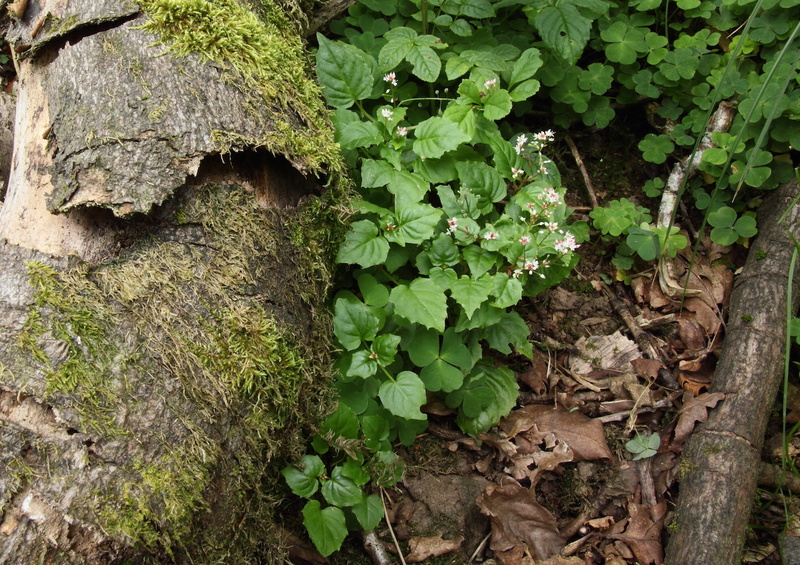 The plant demands shade, and nowhere grows where exposed to full sun. 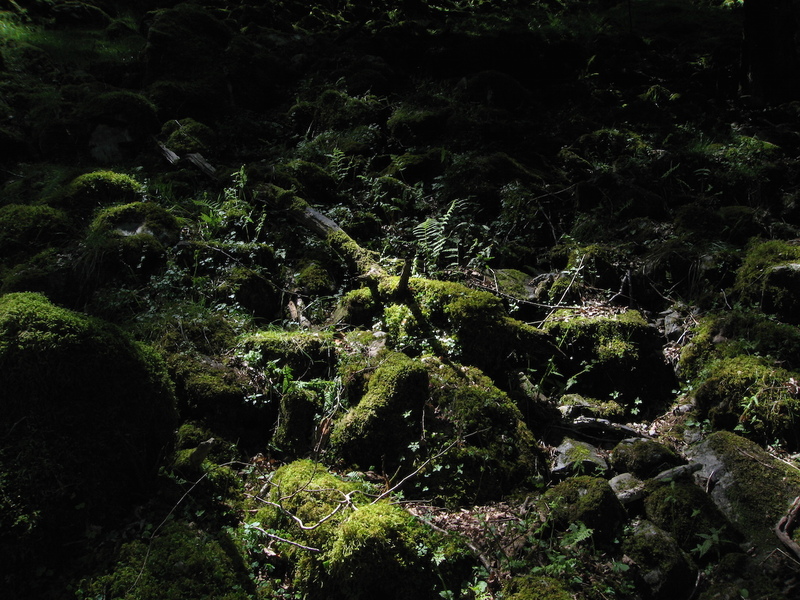 However, that shade can be provided not only by a canopy of trees, but, rather surprisingly, in some places large colonies occur below bracken on steep slopes. 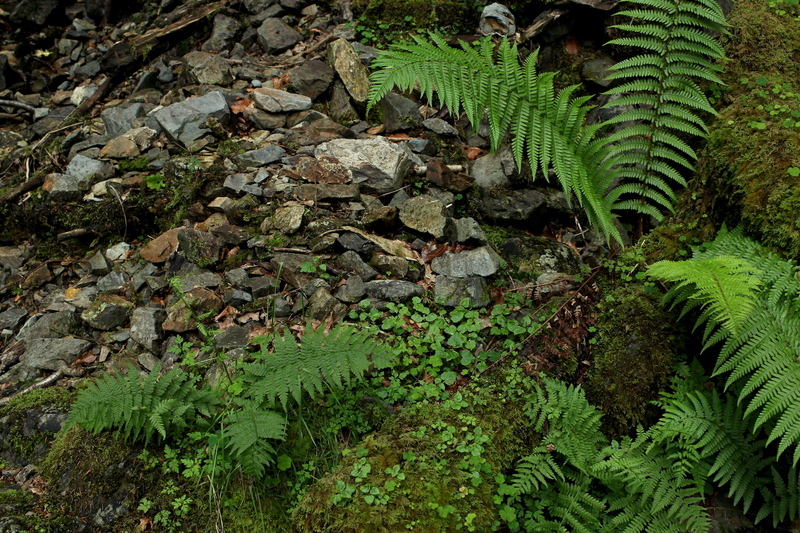 (Since bracken-stands typically indicate places formerly under native forest, it seems clear that the plant has adapted happily enough to the shade of the bracken which replaced the trees.) 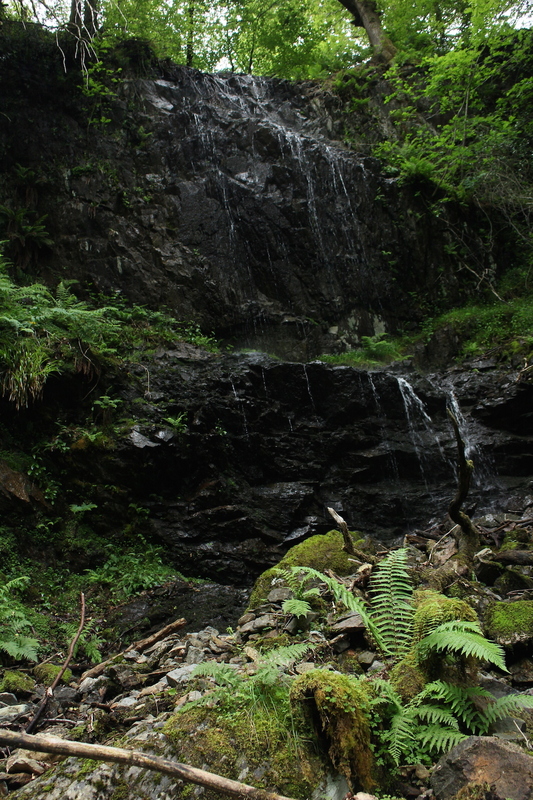 At rather higher altitude and further up the valleys, the plant is remarkably widespread growing in the shade of large boulders. 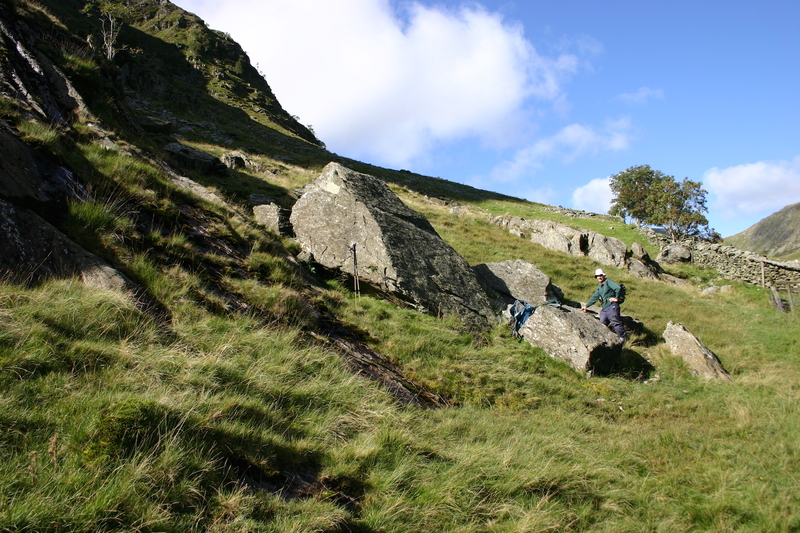 In almost all its sites, it is obvious that there is seepage at the roots, so that the patches tend to occur in the sides of trickles and in screes where water flows below, but seldom where surface water occurs, though it may be nearby. 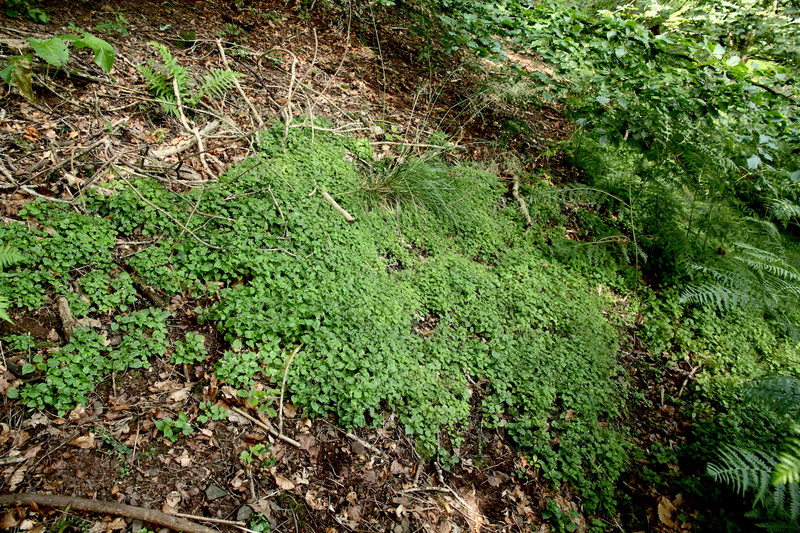 Very typical associates are, in less damp sites, Wood Sorrel Oxalis acetosella, and in damper places Opposite-leaved Golden-saxifrage Chrysosplenium oppositifolium. 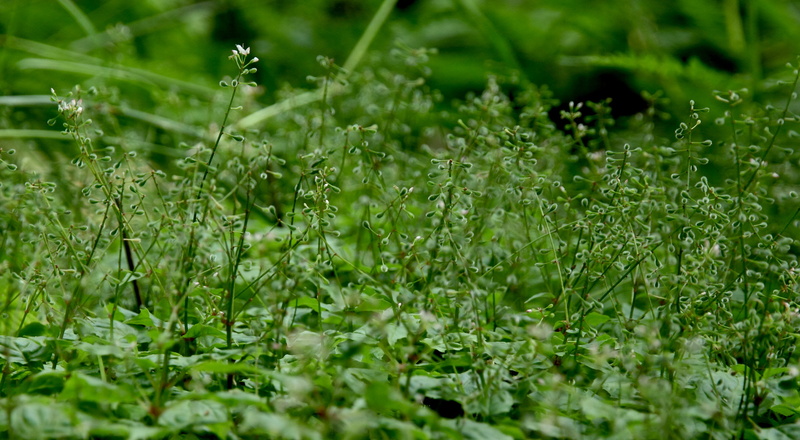 Although in general intermediate between its parents, and despite varying somewhat, it is typically large – too large to be mistaken for the much smaller Alpine Enchanter’s-nightshade. 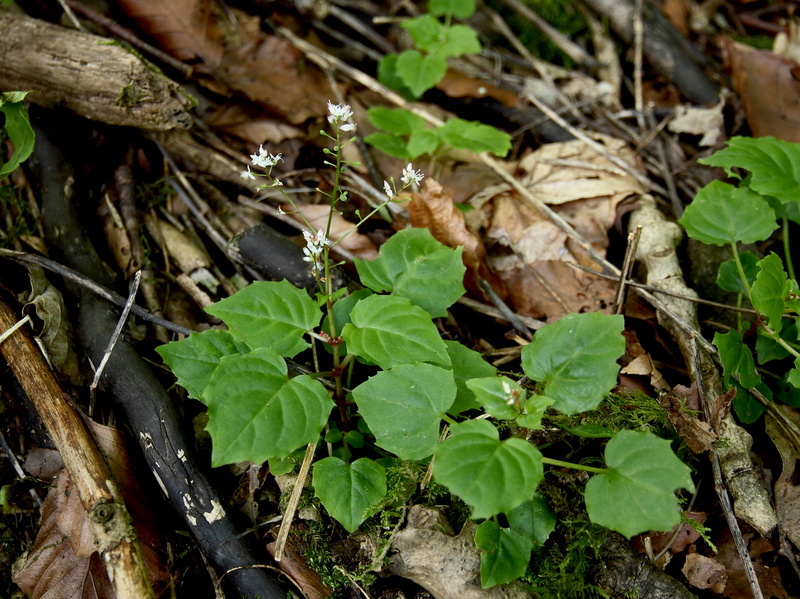 The leaves are relatively elongated heart-shaped (distinctly longer than wide), with the margin sinuate-toothed, although less clearly so than in Alpine Enchanter’s-nightshade. As with its more common parent, the flowering-stem elongates markedly, so that the relatively large flowers, when open, are disposed down the stem below the head of buds. However, very few of the ovaries ripen, so that just below the flowers only a few of the freshest fruits remain. As the season progresses, there may be still flowers opening at the top of the stem, but below that will be a long straight section devoid of fruits (or any remaining will gratefully drop off when touched!). This elongated sterile stem is very characteristic, and immediately separates the hybrid from either its parents, which each carry abundant ripening fruits below the flowers for many weeks before they are shed. 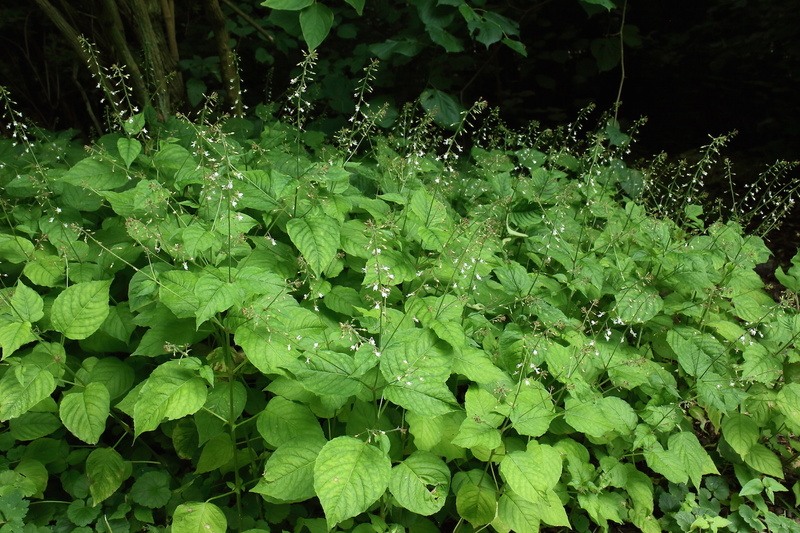 Upland Enchanter’s-nightshade occurs widely through the Lake District, but more frequently on more level ground, for instance in damp woodland by the lakes and along river-banks, but rather rarely occurs with Alpine Enchanter’s-nightshade. 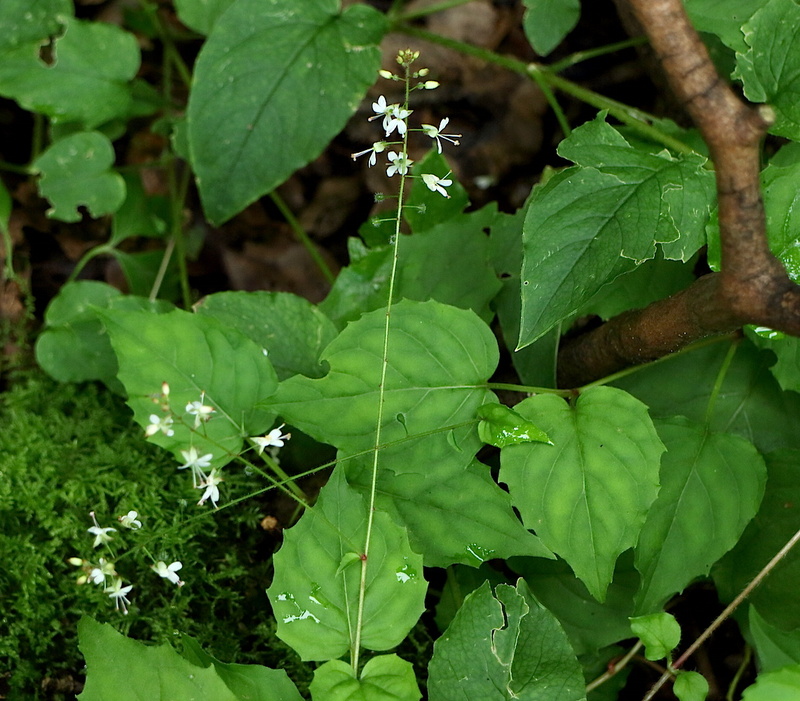 Indeed in several places the common and the Alpine Enchanter’s-nightshades may be seeing growing intermixed, but with no sign of the hybrid, while the hybrid often occurs in the absence, particularly of Alpine, and occasionally also Enchanter’s-nightshade itself. 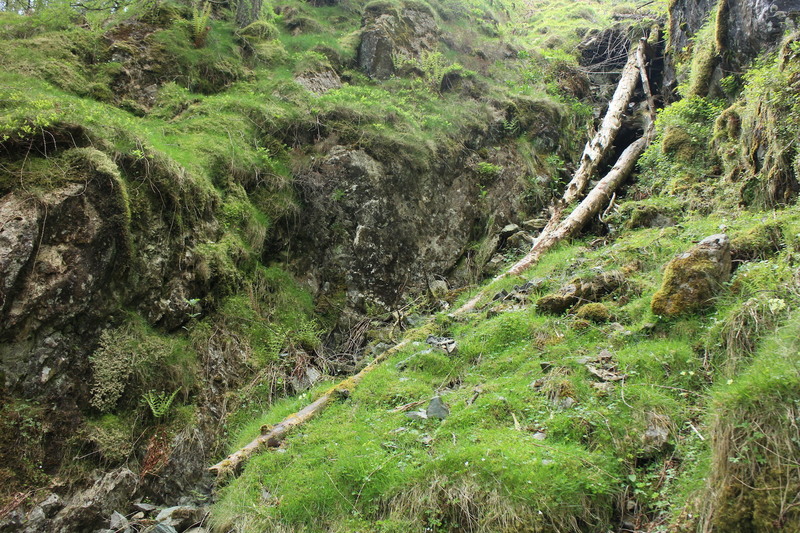 Beyond the Lake District, the hybrid also occurs particularly along rivers, which presumably disperse its vigorously-spreading rhizomes during floods. 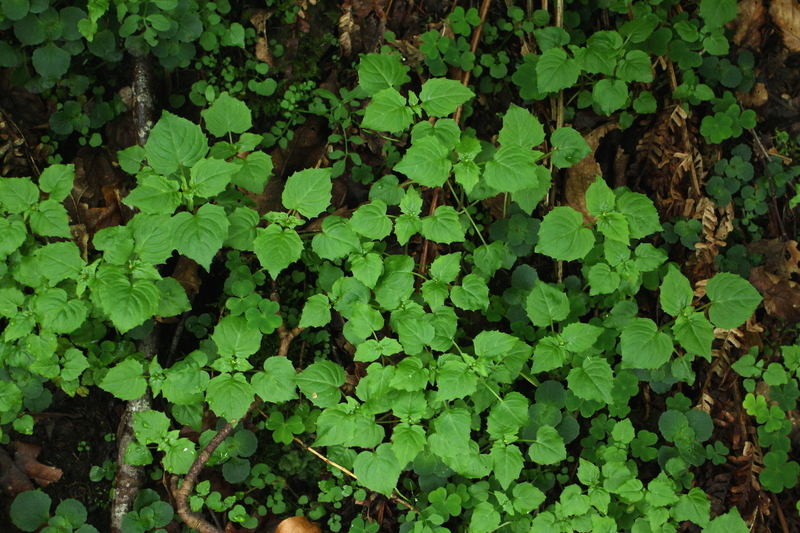 Again it tends to grow in damp(-ish) soil, and largely in shade.